If you want to go out for a relaxing, affordable, and healthy meal, brunch is a great option. You can often order delicious versions of your favorite breakfast and lunch items, including waffles covered in fresh berries and fresh salads with avocado. 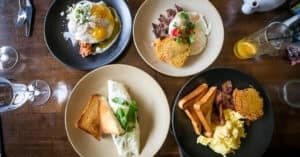 If you are in the Indianapolis area, here are some of the best brunch spots to choose from. Milktooth is a popular breakfast and lunch cafe located at 534 Virginia Ave. in Fletcher Place. It is a cozy and eclectic restaurant with a beautiful upscale interior that you’ll enjoy eating in. The restaurant is open for breakfast, lunch, and brunch from 7 a.m. to 3 p.m. every day except for Tuesday, when the restaurant is closed. By far, customers love the apple Dutch baby pancake, which is made with fresh cinnamon apples and a puffy, golden brown pancake. The restaurant might just be a foodie’s paradise, with their unique take on many of your favorites, such as carrot cake waffles and sorghum glazed bacon. Located at 225 W. Washington St. in Mile Square, Cafe Patachou is best known for their self-serve coffee, fluffy omelettes, and buttery, perfectly toasted English muffins. When you visit the restaurant, you can expect made to order food just the way you like it. You won’t find overcooked or under-seasoned food here. One of the most popular dishes at Cafe Patachou is the bacon broken yolk, served with a runny egg on top of an English muffin. The restaurant is open until 3 p.m. seven days a week. The Garden Table is located at 342 Massachusetts Ave. in the Mile Square. It is a juice, smoothie, and cocktail bar that serves modern breakfasts within an American diner atmosphere. The menu is seasonal, reflecting the most flavorful produce around. Many customers like the El Desayuno, which is chips with mole sauce, chicken pieces, and a fried egg. Unlike some of the other restaurants on this list, The Garden Table is open for dinner Tuesday through Saturday in addition to its normal breakfast and lunch hours. On Monday, the restaurant is open from 7 a.m. to 3 p.m. On Tuesday through Thursday, the restaurant is open from 7 a.m. to 9 p.m. On Friday, the restaurant is open from 7 a.m. to 10 p.m. On Saturday, it is open from 8 a.m. to 10 p.m. and on Sundays, from 8 a.m. to 3 p.m.
Ready for a tasty, Mexican inspired lunch? Go to Nada, located in Mile Square at 11 W. Maryland St. You can try out a wide range of tacos, pork belly dishes, and fresh guacamole. The sangria roja is worth considering, too. This restaurant is open from 11 a.m. to 10 p.m. during the week and it opens at 10:30 a.m. on the weekends. Instead of going to a national chain restaurant for breakfast, support one of these brunch spots in Indianapolis. The food is delicious. Plus, you’ll have the opportunity to see what all of the hype is about.